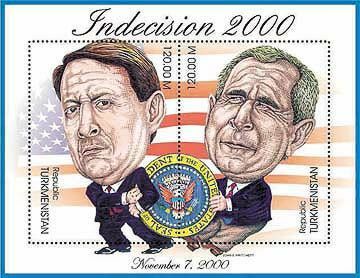 Above: Turkmenistan has recently issued a stamp to commemorate the Indecision of the recent U.S. President Elections between Al Gore and George W. Bush. After 36-days of judiciary struggle, Bush was declared winner by a 5-4 vote in the Supreme Court. Calling the Kettle "Black" - Elmar Mammadyarov - Washington, D.C.